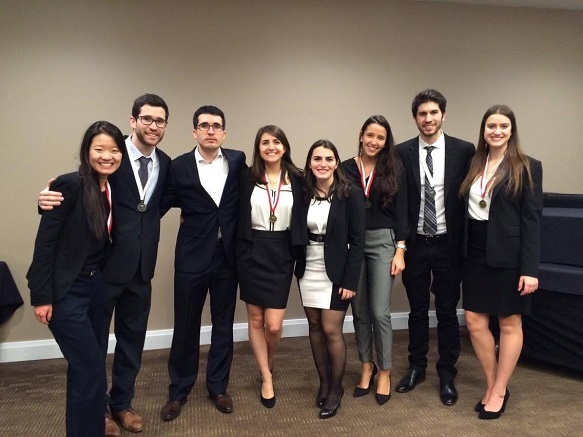 News > 2016 > APICS Canada case competition: Top two places go to HEC Montréal! APICS Canada case competition: Top two places go to HEC Montréal! HEC Montréal MSc and BBA students turned in outstanding performances in the logistics and operations management (LOM) case competition held by the APICS Canadian District this past weekend in Cambridge, Ontario. They brought home first and second prizes in the Lloyd Clive Memorial Student Case Competition, featuring 10 teams from Canadian universities. In first place were MSc students Amélia Di Liello-Roberge and Cathy Pak and BBA students Julie Soriano and Muriel Vergara. They will now advance to the international APICS competition in Washington, DC, in October 2016. And MSc students François-Paul Bourg, Frederic Catillon, Sabine Signor and Victor Lheritier took second place. Congratulations to everyone and thanks to the coaches, Stewart Soh (MSc), Leonard Vincent (HEC 2015), Nicolai Rassolov (HEC 2009, Vice-President, APICS Montreal) and Yossiri Adulyasak (Assistant Professor, LOM)! Cathy Pak, Victor Lheritier, François-Paul Bourg, Julie Soriano, Sabine Signor, Muriel Vergara, Frederic Catillon and Amélia Di Liello-Roberge.